Ever thought of using CBD as part of your regular skincare routine? 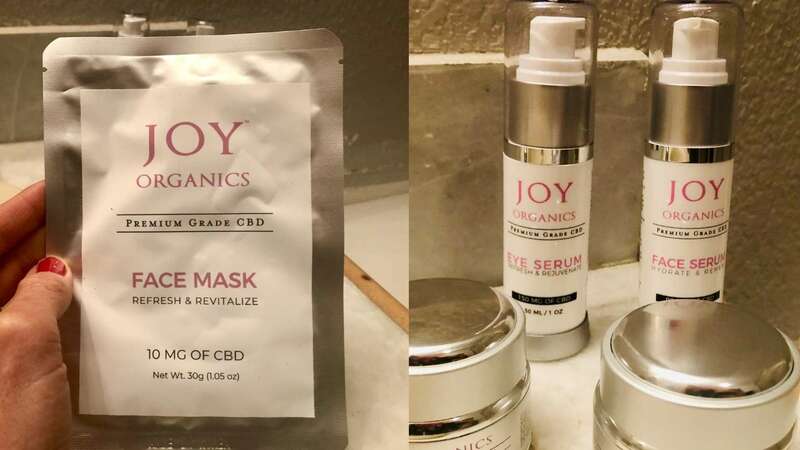 If you haven’t yet discovered the beauty care benefits of CBD, Joy Organics Skincare Bundle might just make you think your beauty regime once and for all. Since discovering Joy Organics last summer, they’ve become one of our favorite CBD brands. Not only do we love their products and use them regularly in our own lives, but also believe they’re one of the most professional CBD companies that exists. At CBD School, we’ve seen plenty of CBD companies come and go. It’s a competitive market and if you’re not on top of your game, you’re likely not going to last. Joy Organics is undoubtedly on top of their game. Needless to say, when their new Skincare Bundle recently debuted, we couldn’t wait to try it. Before we let you in on just how amazing the Joy Organics line of CBD skincare products really is, it’s important to understand why a person would even consider using CBD in their beauty care products in the first place. Sure, CBD has tons of therapeutic purposes, but is it really so beneficial for beauty that you’d want to have it in your skincare products? While most people associate the therapeutic attributes of CBD to the relief of anxiety and chronic pain, as it turns out, the non-psychoactive cannabinoid is extremely beneficial for your skin. There’s a reason CBD is showing up in so many beauty products these days. It’s pretty much amazing for your skin. Whether you’re looking for something to zap your zits, reduce redness from inflammation, clear up eczema or psoriasis, or dip your face in the fountain of youth…CBD could help. Two of the biggest benefits of CBD when it comes to beauty and skincare include its anti-acne and anti-aging effects. Let’s look at both a bit deeper. Anti-Acne: If you’re someone who struggles with acne-prone skin, we feel you. We struggled with acne for years and know just how much living with this skin problem can impact your life. CBD has shown to exert sebostatic and anti-inflammatory properties that have shown to clear up troubled skin. Acne is known to occur when sebaceous glands (oil glands in the skin) attached to hair follicles become stimulated, ultimately resulting in the overproduction of sebum and unwanted sebocyte production. The result? The inflamed, unwanted appearance of acne. While there haven’t been too many studies so far that highlight just how beneficial CBD might be for acne, there are plenty of personal accounts about CBD and acne all over the internet. While our acne cleared up years ago and we can’t make any personal claims ourselves, there are plenty of people who have found success in CBD as a topical anti-acne treatment. Anti-Aging: Anti-aging products are big business. So big that the global anti-aging market is projected to be worth over $331 billion by 2021. CBD is the newest anti-aging product on the scene. If you’re someone who’s concerned about keeping their youthful appearance, forget about Botox. CBD could be just what you need. Aging is inevitable. Aside from the “natural” aspects of aging, like less collagen and oil production, the skin is also subject to environmental factors that can take a serious toll on its appearance. In step CBD, which is known to be a more powerful antioxidant than both vitamins C and E.
Antioxidants help slow down the aging process by reducing the free radical damage caused by environmental factors that can further break down collagen. The anti-inflammatory properties of CBD are also believed to play a factor in its anti-aging effects, as this can relax the skin and reduce the appearance of fine lines and wrinkles. Is CBD the Secret Weapon for Beautiful Skin? 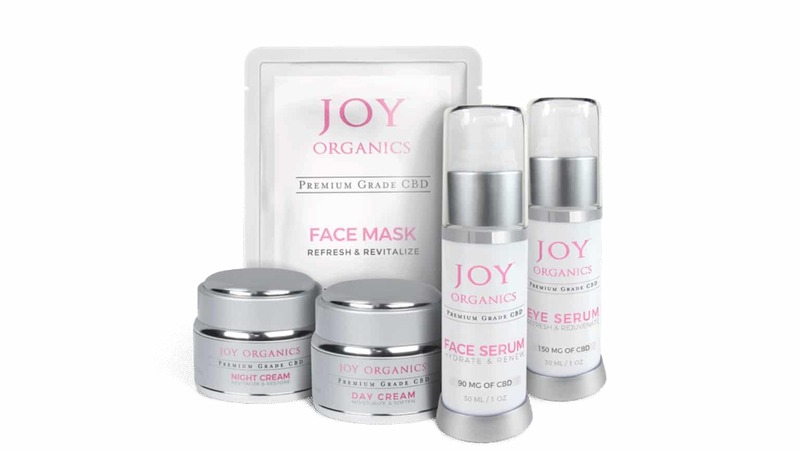 So, what did we think about Joy Organics Skincare products? We’ll give you a hint. They’re likely going to become part of our everyday beauty routine. Here’s what we thought of each. Day creams are designed to be used during the day to defend our facial skin from environmental toxins, harmful UV rays, pollution, and more. Day creams are lightweight enough to be worn alone or under makeup and are one of the most important facets of a well-rounded beauty regime. 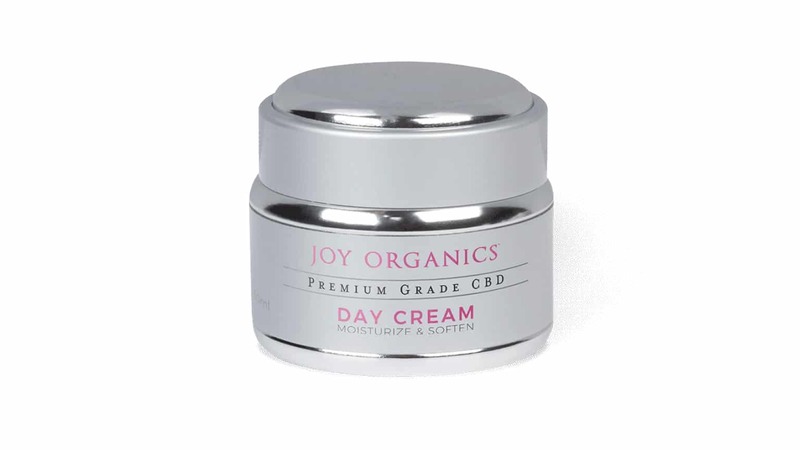 Joy Organics CBD Day Cream was lightweight and went on smooth. It seemed to absorb quickly, and our face didn’t feel at all greasy after application. We didn’t try it under makeup but can see how it would be fine to do so. Will we use it again? Sure. It’s full of some super amazing ingredients aside from CBD that we know are excellent for our skin, such as sweet almond oil, chamomile essential oil, and more. Night creams are a bit different from day creams and are designed to be used, as you guessed it, at night. Night creams are designed to replenish what your skin lost during the day. When we sleep, our skin repairs and regenerates itself, and using a night cream can offer your skin some significant benefits. 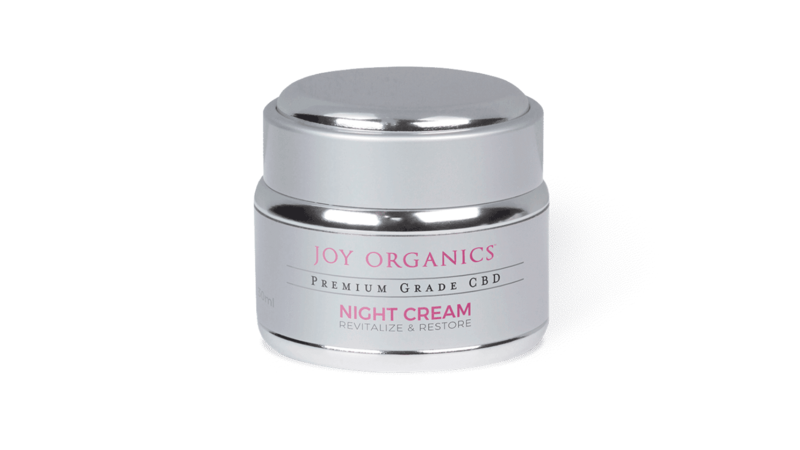 Joy Organics CBD Night Cream does exactly what it’s intended to do. Rich in CBD, as well as other natural ingredients such as verbena extract, lavender extract, chamomile extract, and more, we put on this night cream after washing our face before bed and woke up with our skin looking fresh and rejuvenated. It’s a bit thicker in consistency than other creams you might’ve tried, which is why it’s designed to be used at night. By morning, it’s soaked into the skin and worked its magic. This is definitely a night cream we plan to begin using regularly. Face serums are a bit different than your average facial moisturizer. They’re more lightweight and their ingredients penetrate deeper into the skin to deliver enhanced results. Celebrity makeup artist Kristofer Buckle says that regularly using a serum can make the skin appear firmer and smoother, increase moisture levels, and make pores appear smaller. If you want to reverse the signs of aging, using a facial serum is in your best interest. 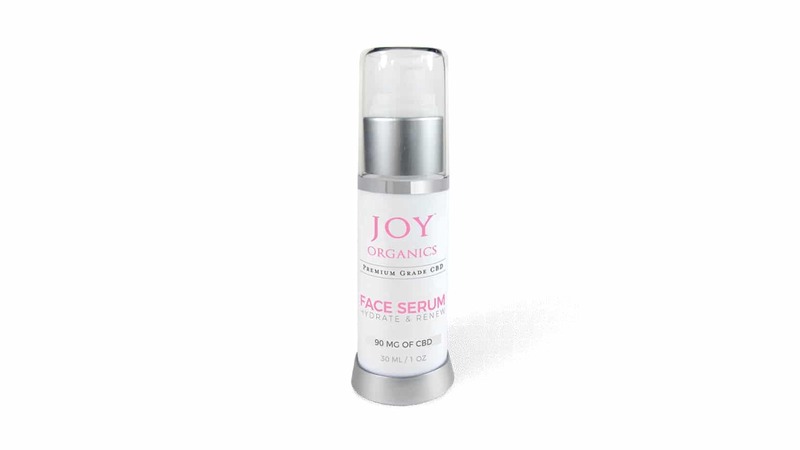 Joy Organics CBD Face Serum did not disappoint. And trust us, we’ve tried several. 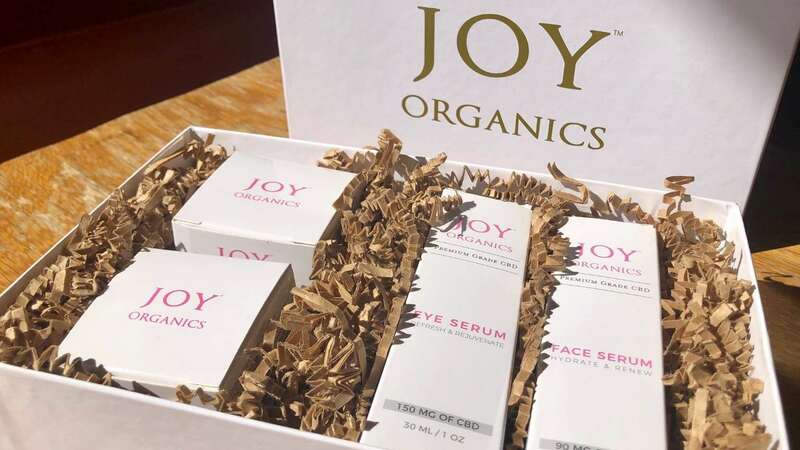 Made with 90mg of CBD oil, as well as extracts of rose hips, milk thistle, citrus chamomile, and more, Joy Organics Face Serum is full of several beneficial ingredients your skin will thank you for. It glided on smooth, smelled refreshing when it was applied, and dried relatively quickly. Did we look ten years younger? Maybe not immediately after we used it, but our skin did feel noticeably tighter after the very first application. We can see how using it regularly might just erase a few years from our face. Eye serums hold up the same principles of face serums. They’re a lightweight moisturizer designed to penetrate deep into the delicate skin around the eye. Joy Organics invites you to “see the world through new eyes” with their CBD Eye Serum. Made with 150mg CBD oil, as well as aloe leaf juice (excellent for reducing inflammation), sandalwood extract (known to reduce the signs of aging), cucumber extract (considered a “superfood” for the skin), and more, this eye serum is considered a multifunctional formulation. Joy Organics contends their eye serum will help increase circulation, rejuvenate your skin, ease puffiness, and reduce dark circles. Just as with the face serum we tried, Joy Organics Eye Serum went on smooth, dried quickly, and had an inviting (but not overpowering) aroma. The skin under and around our eyes certainly felt better after we used it, and we can imagine that after using it every day for a few weeks that we’ll begin to notice a pretty significant difference. We’re big fans of face masks. Face mask with CBD? Even better. 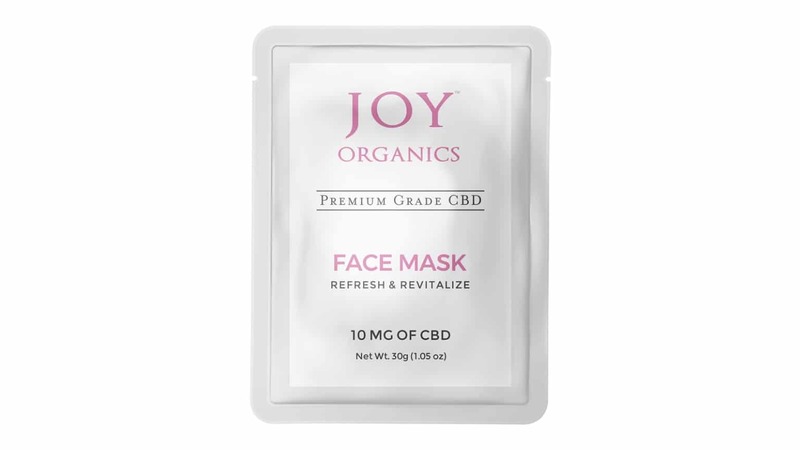 Joy Organics CBD Face Mask recently became one of our new favorite indulgences. It’s a sheet mask, which when applied correctly is designed to create a barrier that keeps the active ingredients in the mask from evaporating. Aside from CBD, Joy Organics Face Mask is packed full of other ingredients that are highly beneficial for the skin. Things like rosemary extract that improves circulation and stimulates cell renewal. Black licorice extract is included to smooth the appearance of fine lines and wrinkles and improves skin’s elasticity. We left the face mask on for about 30 minutes, while indulging in a bath we dropped a CBD bath bomb in. Pure bliss. After removing the mask and applying the remaining serum in the package (per the directions), we went to bed and woke up in the morning with our skin looking and feeling noticeably better than it did before using the mask. The benefits of CBD for the skin can’t be ignored. Celebrities swear by it and there are more CBD skin products than ever before. If you’re looking to benefit from the therapeutic and aesthetic properties CBD offer, Joy Organics Skin Care Bundle has you covered. Short of offering a CBD skin cleanser and toner, they’ve covered all of their bases when it comes to the basics of beautiful skin. We’ll definitely be adding a few of their beauty products into our regular skincare routine. Not ready to splurge on the big bundle? No problem. All of the products featured in Joy Organics Skin Care Bundle can also be purchased separately! Click here to try the Joy Organics CBD Skincare Bundle today! My name is Rebecca Heger. We have an organic boutique hemp farm in Pendleton Oregon and a growing CBD line. I was enjoying some of your informative articles this morning and product reviews. We’d love to have you take a peek at our website.